You won't see anything like this ANYWHERE. Please don't fall for cheap imitations. I am the original. From a distance this looks like a picture of Animal but look closer. Its actually mini-pictures that are 1/4 inch by 1/4 inch with remarkable detail (click on "close up" image). The mini-pictures are of real wild animals from every corner of the Earth and sky. I have gathered and arranged these very carefully myself. Remarkably NO color was adjusted to any individual picture and no photo was used more than once. This is for the true collector. The entire item is 8 1/2 inches by 11 inches and perfect for framing. I guarantee this to be high quality and authentic. The uniqueness of this item cannot be understood truly until you see it in person. Please view it from extremely close-up then at least 10-15 away to get the complete effect. Amazingly the farther you move it away the more detail you see. I have created this myself. It will NEVER be mass produced. VERY limited edition!! No more than 25 will EVER be released! You will recieve a print along with a numbered C.O.A. that has been hand-signed by the artist. My work has been featured nationally on both Coast To Coast AM & TMZ.com, it has appeared on magazine covers and has been purchased by museums. My art is owned by NFL Hall of Fame coaches and has been requested by professional athletes, celebrities and mixed media/pop art lovers in over 20 countries! 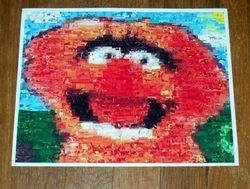 My 'playing card mosaic kits' have been labled The Best Thing on Ebay. Just check my latest feedback to be sure this is a high quality piece of work. If you're not happy I will give a No-questions-asked refund. Check my other Ebay auctions for GIANT 31 X 24 Wall Art editions too, or I can make a custom one for you and let you purchase it through Ebay! !